Mater Prize Home Draw 272 offers an amazing $1,721,600 lifestyle package in the heart of Brisbane. But what makes this one so amazing? 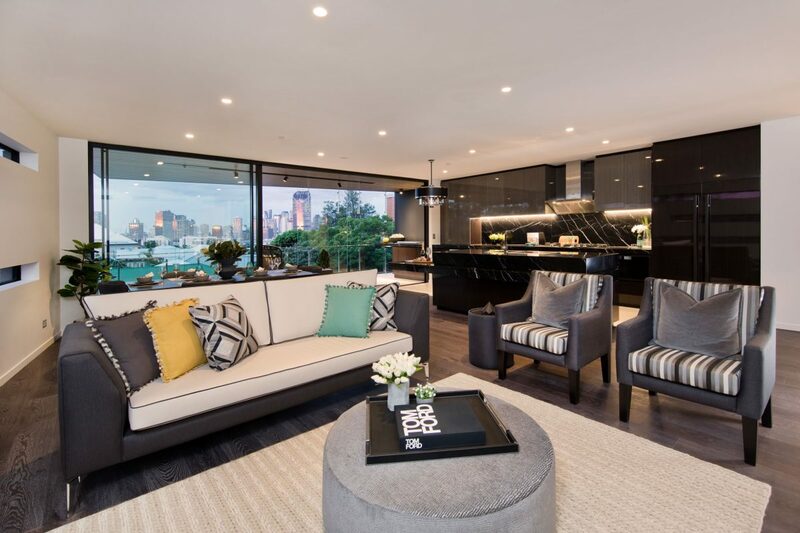 We share the 5 best features of the latest Mater Prize home. Highgate Hill is in the cultural heart of Brisbane, bordering the eclectic West End and the sophisticated restaurant precinct and parklands of South Bank. Your biggest decision each weekend will be “where to brunch?”. Local favourites The Gunshop Cafe and Billykart are only a short walk from home. plus the lure of breakfast by the Brisbane River, you will have endless options for coffee dates. Enjoy a bike ride? Well, you are in luck. Nearby are riverside tracks and dedicated bike lanes, making your commute to the city a breeze. Plus you can watch the sunset in the park, conveniently located next door. The walking track starts across the road and leads up to a lookout gazebo. You’ll be amazed at views over the Brisbane skyline. Don’t worry – we haven’t forgotten dinner. Finish your day dining on some of the state’s best international food. The Gabba precinct in the area is offering some of Brisbane’s best Italian and French cafes. Plus with the hub of Greek restaurants to be found in West End, and Turkish, Americana and Spanish restaurants in South Bank, you can choose a new cuisine each night. The underrated gem of the best homes are generous cupboards – places to hide treasures, store extra bedding, place your DVD collection or just the dozen pairs of jeans you’ve collected over the years. Many people forget the importance of these storage spaces when choosing a home. But The Highgate has you covered. In the hallway, there are two double door cupboards for your personal storage. Thereby placing items out of the eyes of guests. The main bedroom features a luxurious walk-in robe the size of five traditional standalone wardrobes; and bedroom 2 and 3 have fully built-in wardrobes that almost reach the apartment’s high ceilings. The laundry hasn’t been forgotten either, with a double sized wardrobe, plus an under bench storage space long enough for four cupboard doors. Nothing beats a homemade roast on a Sunday afternoon surrounded by loved ones. But to make it even more exciting? You will be cooking on a marble cantilevered island bench top, in an opened planned kitchen, allowing you to continue catching up with friends on the latest news, whilst they sit nearby with a drink from your wine cooler. 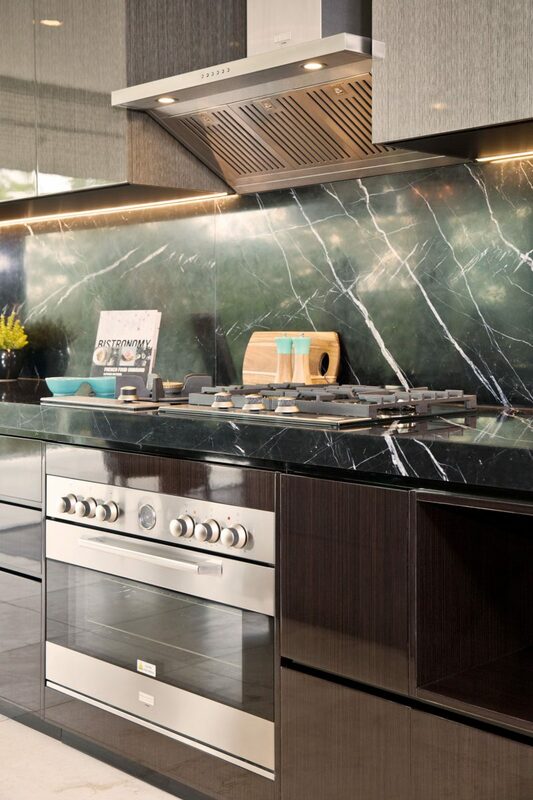 Not only will you see the luxury, but you will feel it too, as your cooking skills are enhanced with Neil Perry’s specially designed kitchen appliances. From a top of the range oven that gives you precise temperature control for delicate recipes; to a professional induction cooktop with multiple rapid heating gap cooktop burners; you will be whipping up a storm worthy of a Sydney harbourside restaurant. If the day is warm, you don’t need to feel the heat in the kitchen – you can also cook up lamb chops on your in-built balcony bbq. So many apartments these days only come with 2 bedrooms and a single car park (if you’re lucky!). But The Highgate apartment in the latest Mater Prize Home draw offers three double bedrooms plus 2 car parks! That allows you to house a family of 4, or just host guests for a weekend. And no more worries about finding a street park for your second car! Both cars will be safely parked overnight in the basement car park. The basement also holds an additional lockable storage area for your private use, perfect for hiding away a winter heater, your bicycles or even that floral lamp your grandmother gave you one year at Christmas. Upstairs is one more surprise. The apartment has a separate room for quiet study. Its private study is large enough to be utilised as a home office – and host clients. There’s no need to dash to the shopping centre to fill your new Mater Prize home – it comes fully furnished! Included are luxurious furnishings, plus inside plants and home accessories, so all you need to bring is your clothes and toiletries bag. The master bedroom has a selection of traditional and European pillows upon the multi-textured bed linen, plus twin bedside tables and an old fashioned alarm clock. The dining room even comes set for your first dinner party. With moss green plates, olive green side plates and generously sized bowls, you can invite friends around to celebrate your first night in your new home. Plus you will impress your friends with your long-stemmed wine glasses, when you serve up a cool chardonnay from your wine cooler. The dual zone cooler offers storage for 16 bottles at temperature range of 5-12 degrees (perfect for Sauvignon Blanc). Plus, 30 bottles at 12-18 degrees Celsius (great for Barossa Reds). Also, it features 6 wooden shelves, double-glazed, anti-UV glass door and sophisticated blue LED lighting. You can also cool down after a hot Brisbane summer’s day with a swim in the property’s 25 metre lap pool. If you have loved possessions you can’t bear to part with, Mater Prize Home Lottery make bringing your personal items with you easy, with a $50,000 gold bullion included in first prize – very helpful when booking movers!